Want to see online lesson in action? NOTE: The audio player should appear above, if not, please click on the title of this post and go online to hear. Back in the not-so-distant past, you were limited to vocal lessons with coaches whose offices you could physically get to. Now quite literally, the sky's the limit! 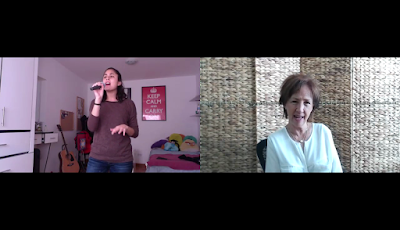 Many vocal coaches like me teach over webcam. Currently I estimate that more than half of my lessons are online with students across the globe. Here's what I've learned from my experience working this way. Skype: This is the most widely known software program or application (called an app on your mobile), that you can use to meet over the internet. It's so common it's become a verb... let's Skype at 6! But there are now several other alternatives - including one I actually prefer instead of Skype. I'll tell you about it a little later in this post. Online: Because of course, you have to be online to connect. Virtual: Because teacher and student are not actually in the same room. Webcam: This is hardware you need to capture audio and/or video. It can be an external or internal mic/camera on your computer or can be the mic/camera on your phone or tablet. It's better to work with a higher level vocal coach over Skype than a lesser quality coach in person. So there's no need to settle for bad or mediocre vocal lessons. A high end vocal coach usually charges more, sometimes quite a bit more. You also could miss out on local networking. In my experience, it's usually best to work with one coach at a time. You could take a trial lesson or two with multiple coaches. But then I'd suggest you decide whose approach works best for you, and stick with them as your main source of training. You can always take from another coach later if you wish. That said, some people really like meeting in person with a local vocal coach who can also provide local performance opportunities. And it is certainly not my intention to suggest you can't find a world class vocal coach where you live... because sometimes you truly can! My hat is off to all caring, intuitive, awesome local coaches. These are folks I love to discuss 'all things vocal' with! The point is, if you can't find a good local coach, virtual accessibility means you are no longer limited in your choices. As long as you don't get confused or pulled between opposing advice, you can try using both coaches. It's a good idea to stay transparent about what you're doing so that if there is confusion about a vocal technique or concept it can be sorted out. Sometimes a student will devote their lesson with me to a conference call (phone or webcam) with their local coach, which I'm very happy to do. Good teachers are always up for learning something new that works for their students! You can get to your lesson from any device that will run the Skype or alternative application... your desktop computer, laptop, tablet or smartphone. You can take your lesson from anywhere in the world as long as you have internet connection with adequate signal strength. You don't need to factor in travel time or gas mileage. And Skype, along with most alternative apps, is free. You have to have a device that the webcam application works on... and it won't work on a regular phone. You need to be able to install the Skype or other software, know how to set it up and work it, or know someone who can help you. And you do need that internet access with strong enough signal. If not adequate, the video will freeze, be very pixilated and the audio will skip badly, or the internet call will be disconnected altogether. Skype is no longer the only game in town; now there are several alternatives for online meetings. Most are about the same or worse audio/video quality, and some like Google Hangouts require both parties to sign up to the application. Facetime only works between Apple gadgets; no good if you're an Android user. But there is another option I'm excited about that works on everything: It's called Zoom. The audio and video are much higher quality. It's very simple to connect... either party can send a link to the other through email to join the conversation. There are paid versions but it's free to use at the basic level, which has more than enough functionality for vocal lessons. Because of how well Zoom is performing for me and my students, it's currently my preferred way of teaching over webcam. Before Skype (and now Zoom), I used to teach distance lessons by phone. The tone, inflection and other sound nuances in the voice of my student can tell me what they need to change. For instance I, like other intuitive vocal coaches, can tell by the sound of the student's voice whether their eyebrows are active or frozen! Now when our internet connection gets too sketchy, I ask the student to call me on the phone, put their phone on speaker mode and we just work the old way. If it's mainly the internet audio that is corrupted but video signal is clear enough to be useful, my student and I leave our screens up but turn our computer speakers off. Then we can watch each other on screen, but listen and talk by phone. Not all good vocal coaches work via Skype. Because audio and video on Skype are frequently digitally corrupt, some vocal coaches don't like using it. Others like me can take a signal that's a bit corrupted, fill in the aural and visual blanks as we do with picture pixels, and still have enough information to assess and correct the student's technique. A bit of rabbit trail trivia... did you know that no one ever uttered that exact phrase in Casablanca? It is important to be able to record vocal exercises and any other thing the coach wants the student to practice or focus on between lessons. For Skype, there are several programs that you or your coach can use to record audio and/or video. I've used Evaer and Pamela, but there may be even better ones out there. Zoom has built-in functionality for recording audio and video. The record button is right there at the bottom of the screen . Both Skype and Zoom have texting and attachment capabilities. You can also record your online lesson from computer speaker right into the memo app of your phone. Speaking of phones... you can always work over a simple phone! You don't need a 'smart phone'; a landline or basic cellphone works just fine! With all the free and low-cost phone call programs like Vonage, Viber and the like, when you need your vocal coach to warm you up for your gig from a parking lot or green room in TimbucTu Arkanscavia, you can reach them! Need a vocal lesson? Where there's a phone, with or without a webcam, there's a way! For a closer look, check out my Youtube vocal lessons to watch me work over Zoom with several students with different vocal issues. If you'd like to try an online lesson with me, contact me and let me know your best time frames. I'll get back with you asap. If you have questions or comments about online lessons, please post them here! Great info Judy... I didn't realize you could do vocal coaching virtually. I should have realized it since you can do just about everything else virtually, but I didn't. What a boon for voice coaches! I love Zoom too. Skype has always been a favorite of mine, but for the video part ... Zoom is creeping in quickly as my go-to. Thank you for the great information! Terry... I'm so happy to add value to your work in some way; you certainly have added value to mine with your suggestions and training! How interesting that vocal lessons can be done virtually. It's an amazing world that we can get coaching and see the person in real time. You certainly know your stuff, Judy. Thank you so much for this feedback, Jo! Yes, it's an amazing fact that I can connect anywhere in the world from my computer chair... or phone! Great article Judy. I really wanna join online music tutorials. can you please suggest me. Thanks for the great content. really nice and helpful. Not completely sure what you're asking, Arvind. Online music lessons are as I mention in this article. And of course you have lots of free info in this blog and podcast.